This is only possible by the .ies script. 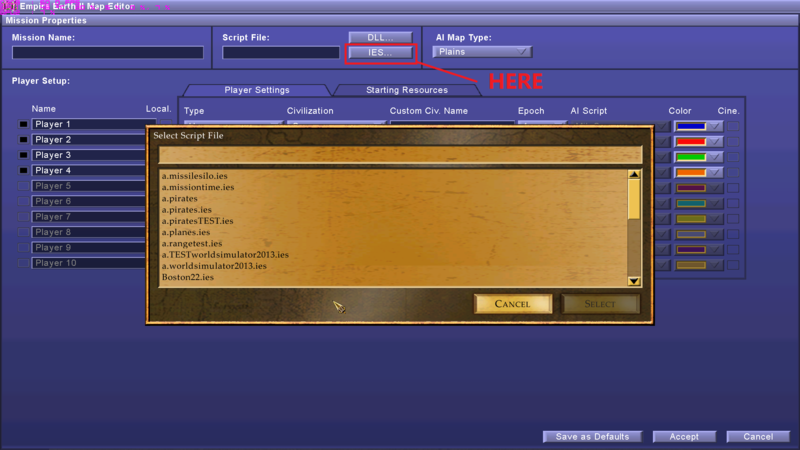 You can learn all available scripts from file Empire Earth II\Scripting Docs\EE2 SCRIPTING.doc (the folder where game is installed). 1. Go to "Documents\Empire Earth II\Scripts" (or "Documents\Empire Earth II The Art of Supremacy\Scripts" if it's EE2: AOS). 4. Create an empty text file, but rename .txt extension to .ies. Call it for example "Cristo96_scenario.ies". 5. Click the right mouse button on that file, then "Edit with Notepad++" from the list. Please remember to remove "SetMaxPopCapacity" for players who are not in game. For example if there are only 4 players in game, change "SetMaxPopCapacity(5, 999);" to "//SetMaxPopCapacity(5, 999);" to disable it (or simply remove from the file). Change "HUMAN_PLAYER" to player ID (number). For more options simply read "EE2 SCRIPTING.doc" from the folder mentioned above. Also please don't forget to check some topics available in this subforum. There are sample script files and other useful posts. Is there a complete list of these settings? Did you read the "EE2 SCRIPTING.doc" document? Was there any function that could fit your needs? If yes, please provide the code you used, so I can see if it was correct. It will disable the fog of war (revealed map) and re-enable it, but all items will remain explored. AI_SetAttackFactor, AI_SetBuildTimeFactor, AI_SetBuildCostFactor do the same thing as AI levels in EE2. Just need to find % number in AI level description and set the same.